Ken Rudin and Loren Jenkins National Council Event at the Temporary February 16th. Joshua Johnson with Larry and Doris Ashkin at the summer National Council event. Summer 2017 National Council event with Joshua Johnson of 1A at the home of Larry and Doris Ashkin. Ira Flatow of Science Friday is interviewed by Danielle Dana at the Aspen Design Room in February 2017. Anne Porath and Jay Hughes at the February 2017 National Council event: a conversation with Ira Flatow of Science Friday. NPR's President and CEO, Jarl Mohn, in conversation with Loren Jenkins. Justice Stephen Breyer speaks to APR's National Council in June 2013. Members of the National Council of Aspen Public Radio share a common passion for public radio and all that it offers our community, the nation, and the world. In turn, the financial support of the National Council is crucial to Aspen Public Radio's continued relevance and public service. Members of the National Council give an annual donation of at least $2,500 to Aspen Public Radio. 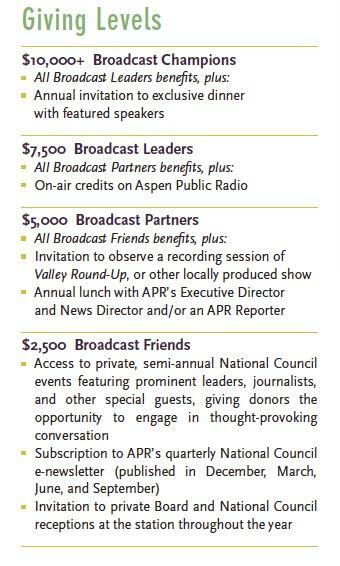 Through their membership, these valued donors advance to a higher level of engagement with Aspen Public Radio, providing a more rewarding relationship for both the National Council members and the station. As the Valley's leading NPR member station, Aspen Public Radio is committed to bringing the best public radio programming to the Roaring Fork and Colorado River Valleys. Through the ongoing involvement of our National Council, Aspen Public Radio will continue to expand what it offers to the community. The National Council safeguards our ability to accomplish this fundamental goal. Invitations to special National Council events with prominent NPR journalists and personalities, as well as other engaging speakers, who share their knowledge and expertise. These enlightening, entertaining events occur twice a year and are hosted in private homes or local venues. Guest speakers have included Justice Stephen Breyer, NPR Foreign Correspondent Deborah Amos, NPR’s CEO Jarl Mohn and former Secretary of State Madeleine Albright. Subscription to APR’s quarterly National Council e-newsletter. Invitation to private Board and National Council receptions at the station throughout the year. A meaningful connection to the station and our evolving needs and goals. Recommendation by the Aspen Public Radio Governance Committee along with an annual gift of $2,500 or more, or an Evergreen Membership starting at $208 per month, entitles you to National Council membership. Make your secure on-line donation today. For questions, please call (970) 920-9000 or e-mail Development Associate Lauri Jackson at lauri@aspenpublicradio.org.